Panic attacks are just a misfiring of the body’s natural alarm system. This alarm system is designed to mobilize our energies for fight or flight in response to a life-threatening situation. Unfortunately, it can go off in the absence of physical danger for a variety of reasons. Such false alarms can be traumatic. Luckily, there are plenty of techniques that you can use to reduce their intensity and duration. The following are some research-supported ways to reduce anxiety and panic. Regaining control of your mind can stop a panic attack in its tracks, or at least significantly reduce the symptoms and duration. This can be done by challenging faulty beliefs and thinking more realistically. Keep telling yourself that nobody has ever actually died or gone crazy as a result of a panic attack. The attack will pass, and you’ll feel normal again. You just have to ride it out for a few minutes, and concentrate on breathing slowly and deeply to make it end as fast as possible. During an attack, there is a tendency toward catastrophic thinking (imagining the worst). Snapping an elastic band on your wrist to shift your attention or saying “stop” in your head when catastrophic thoughts start taking over can be helpful. Some people find it beneficial to say coping statements out loud or in their heads during an attack (if you need ideas, Psychologist Thomas A. Richards provides a number of coping statements such as “Anxiety is not dangerous – it’s just uncomfortable. I am fine; I’ll just continue with what I’m doing or find something more active to do.” (For a full list, visit the Anxiety Network) . Panic attacks can be triggered or worsened by bad breathing practices. People who are panicking tend to hyperventilate (breathe quickly and shallowly, just into the upper lungs), which causes many of the nasty symptoms they experience, including nausea, confusion, dizziness, tingling or numbness, and the feeling of being unable to take in enough air. Breathing slowly and deeply, by contrast, activates the parasympathetic nervous system, which has a calming effect, slowing your heart rate, reducing muscle tension, lowering blood pressure, and bringing about a sense of well-being. Techniques that require breathing and counting reduce anxiety in two ways. First, slow, deep breathing triggers a physically calming response. Second, the counting requires brain power, so it displaces panicky thoughts that cause anxiety to rise and feed the nasty physical symptoms. The simplest calm breathing method is to breathe in slowly through pursed lips (as though you’re blowing out a candle) while counting to 4 or 5, then breathe out slowly through your nose, again counting again to 4 or 5. Be sure to breathe deeply into your diaphragm rather than shallowly into just the top of your lungs. If you place a hand over your upper stomach, you should feel your diaphragm rising and falling with your breath. Tactical breathing is a technique used by military personnel and others who go into scary situations to calm their nervous systems so that they can face danger without panicking. It involves counting to 4 slowly during the in-breath, holding for a count of 4, breathing out for a count of 4, waiting for a count of 4, and starting the cycle over again. Yogis have developed a number of calming breathing techniques. A particularly effective method is to place a finger against one nostril, breathe in for a slow count of 4, then release that nostril, cover the other, and breathe out for a count of 8. Next, breathe in for a count of 4 with the nostril you just used to breathe out and then switch sides to breathe out for a count of 8. Keep switching sides and maintaining this slow, controlled breathing – it will help you regain control of your mind and body. If you do a search, you’ll find variations of this exercise online, with different counts. Some also require holding the breath after breathing in, before switching nostrils. However, all recommend alternate nostril breathing and counting, and most recommend that the out-breath be longer than the in-breath. Folk wisdom holds that splashing some cold water on your face can help you calm down and regain control of your anxiety, and there is a scientific basis for this. In addition to its grounding effect, a splash of cold water can slow your heart rate due to the mammalian diving reflex. The mammalian diving reflex causes a number of changes in the body that are designed to help animals (and people) stay underwater for longer by enabling them to go longer without taking a breath. One of these responses is to slow the heart rate. According to Rennie (March 22, 2012, Scientific American), the diving reflex can trigger a heart rate reduction of 10% or more. Given that one of the most intense symptoms associated with panic is a rise in heart rate and that many of the nasty psychological symptoms associated with panic attacks (such as fear of dying) can be triggered by a rapidly beating heart, splashing cold water on your face has the potential to calm your heart and your mind. There are a number of techniques that you can use to ground yourself more firmly to reduce feelings of being detached from reality or outside of yourself during a panic attack. If you’re feeling spacey and disconnected from the collective reality, it can help to connect with something solid. You can grab a doorframe, run your fingers along an object in your pocket (i.e., keys, good luck charm, etc. ), play a musical instrument, or do something else that reconnects you with the world. Additional ways to ground yourself within the tangible world are to walk barefoot, take a bath or shower, go for a swim, exercise, eat something healthy like an apple or whole-grain snack, or clean the house. Anything that brings you back in touch with your surroundings in a positive way is beneficial. If you’re having great difficulty distracting yourself from panic symptoms during an attack, Margarita Tartakovsky, MS (2012) suggests holding an ice cube in one hand for as long as you can stand it, then switching it to the other hand and doing the same thing. Your mind will shift to focusing on the discomfort in your hand and away from other unpleasant sensations, which can de-escalate the symptoms of panic (the ice cube can be placed in a paper towel to make the sensation less unpleasant if you prefer). A panic attack occurs when the body releases a burst of adrenaline to prepare for a fight-or-flight response. In the past, this helped us escape from predators, aggressive humans, and other threats. However, in the modern world, when triggered by non-life-threatening stressors, this adrenaline burst causes nasty symptoms because it’s not being used for its intended purpose. Assuming that you don’t have severe mobility limitations or health problems that preclude exercise, you can get rid of this excess adrenaline by doing what your body wants to do – run – or something similar. Cardio exercise is a highly effective way to not only end a panic attack early but reduce the likelihood of suffering future panic attacks (many people find that regular cardio exercise eliminates their panic attacks completely over time). So go for a run or brisk walk, do jumping jacks, ride your bike, go for a swim, or use an exercise machine if you have one handy. If exercising at home, put on a TV show, movie, or music to distract you from the panic sensations until you regain a feeling of calm. Some people get anxious initially when exercising because the natural increase in heart rate they experience reminds them of a panic attack. However, if they push through this fear, they eventually achieve the benefits of exercise without becoming anxious. In addition to providing short-term relief, exercise is among the most effective long-term treatments for panic and anxiety. See Exercise as an Anxiety and Panic Disorder Treatment for more information. Anything that produces a competing positive response or uses up the excess adrenaline associated with a panic attack (brisk walking, running, etc.) has the best chance of success for most people. In day-to-day life, it’s a good idea to incorporate activities that will provide more long-term relief, such as cognitive-behavioural therapy, meditation, nutritional changes, regular cardio exercise, and other natural therapies. Realistic Thinking, Expanding Your Comfort Zone, and Turning Your Focus Outward are highly effective mind-based therapies that you can do on your own to reduce anxiety and other negative states. For tips on addressing problems that often contribute to anxiety, see How to Improve Sleep, How to Reduce Stress, and Assertiveness and Anxiety. See also Conditions That Often Accompany Anxiety Disorders, Panic Disorder, and Natural Anxiety Supplements. This article assumes that you’ve received a diagnosis of panic disorder from a doctor and that you don’t have heart disease, asthma, or other medical conditions that could trigger symptoms similar to those of a panic attack. If this is your first time experiencing these symptoms, see a doctor to make sure that you have a clean bill of health before assuming that the problem is panic disorder. Also, if you have been diagnosed with a heart problem, asthma, or another condition that may cause physical complications, consult a doctor before attempting home care for panic attacks. American Psychological Association. (2012). “Answers to Your Questions About Panic Disorder.” APA.org. Borum, R., Dr. (2009, July 22). “The Power of Breathing.” Combat Sport Psychology, CombatSportPsychology.Blogspot.ca. Bourne, Edmund J., PhD. (2005). The Anxiety and Phobia Workbook. Oakland, CA: New Harbinger Publications. Dryden-Edwards, R., MD (Author), Conrad Stoppler, M., MD (Editor). (2010, March 25). “Panic Attacks.” EMedicineHealth.com. Lerche Davis, J. (Reviewed by Louise Chang, MD, 2005). “The Science of Good Deeds: The ‘Helper’s High’ Could Help You Live a Longer, Healthier Life.” WebMD.com. Maertz, K. (2014). “Panic/Anxiety Attacks.” University of Alberta, UWell.UAlberta. Rennie, J. (2012, March 22). “How the Dive Reflex Extends Breath-Holding.” Scientific American, ScientificAmerican.com. Tartakovsky, M. MS. (2012, May 29). 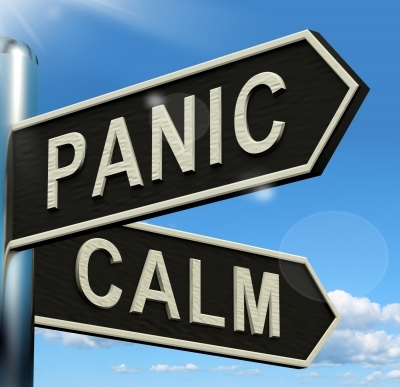 “How to Halt and Minimize Panic Attacks.” PsychCentral.com. Wilson, R., PhD. (n.d.). “Panic Attacks.” Anxieties.com. Wilson, R., PhD. (1996). Don’t Panic: Taking Control of Anxiety Attacks. New York, NY: Harper Collins Publishers, Inc.
Yoga Infocenter. (2007). “Nadi Sodhana (Alternate Nostril Breathing).” HolisticOnline.com.